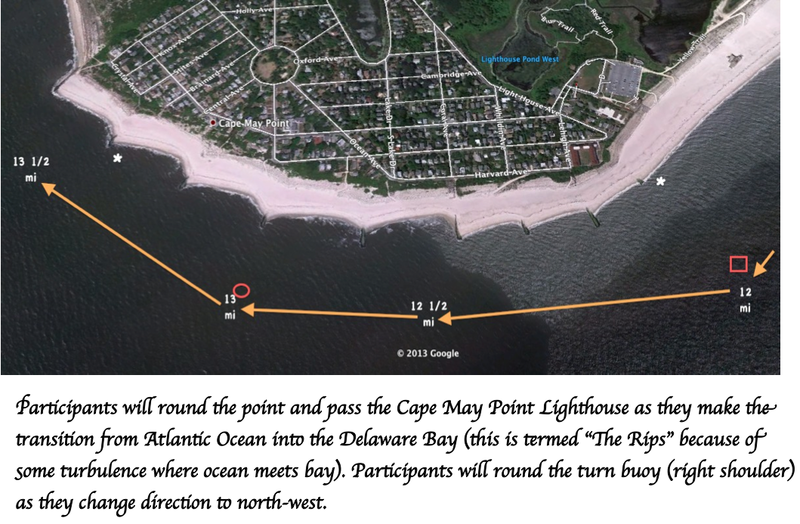 This entry was posted on September 16, 2013, in Open Water, Swim Heroes and tagged C3 - Cape Circumnavigation Challenge, Cape May Lighthouse, Cape May Rips, Charlotte Samuels, David Barra, Grace van der Byl, Jason Malick, Open water swimming in Cape May. Bookmark the permalink. The water has settled, and I finally have time to write my C3 – Cape Circumnavigation Challenge race report. And there is PLENTY to say! 15.1 miles, and my first time ever swimming that distance. I don’t think I could have asked for a better beginning. First let me say that it was fantastic weekend in many ways. Yes, there was swimming – and a lot of of it – but there was also being an active part of the community of open water swimmers, a group I admire in so many ways. From the beginning, I felt honored to be accepted as one of the swimmers for this inaugural race, one I hope will become a tradition. 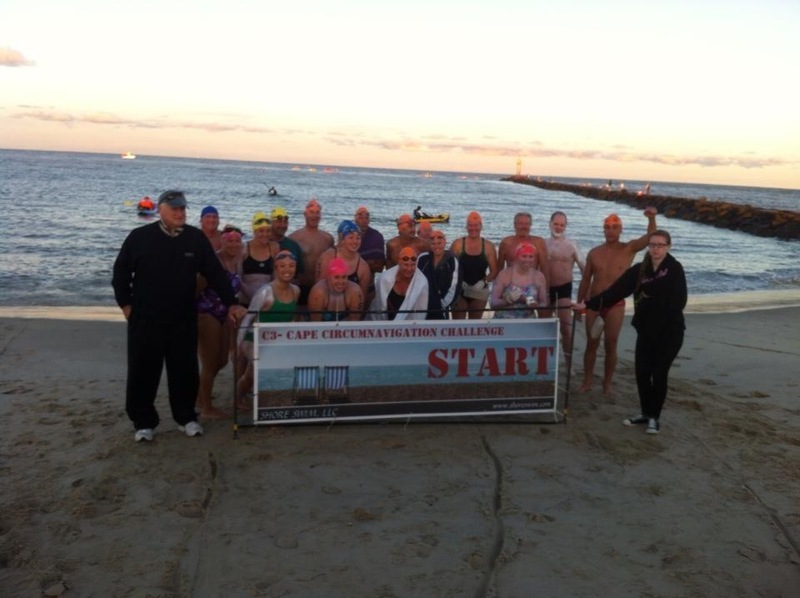 Limited to 25 swimmers, the field included standouts in the open water swimming community. These were folks who’ve done multiple channel crossings, Triple Crown holders like David Barra who’ve done Catalina, the English Channel, and the Manhattan Island swim. There were swimmers like the Catalina crossing record holder, swimmer Grace van der Byl, and one amazing young woman, Charlotte Samuels, who at 15-years-old recently completed the 17.5 mile Ederle Swim in New York. I don’t know what you all were doing at 15-years-old but I sure as heck didn’t have interest in, or discipline for, something as physically, mentally, or emotionally challenging as marathon swimming. 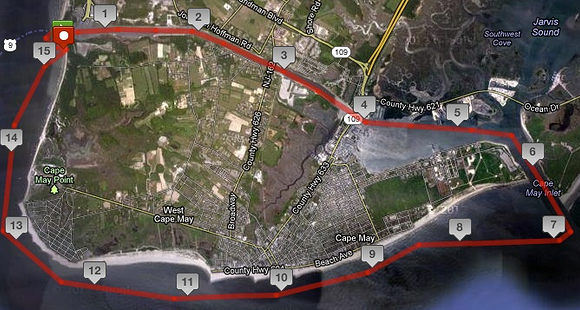 The Cape May swim was billed as a challenge indeed, offering an entirely different perspective on a historic area. The Destination is iconic. Perhaps not what you envision when you first hear “Jersey Shore” and think of the MTV series; Snooki, JWoww, Vinny, Pauly D, yada yada yada. NO, this is the real deal! 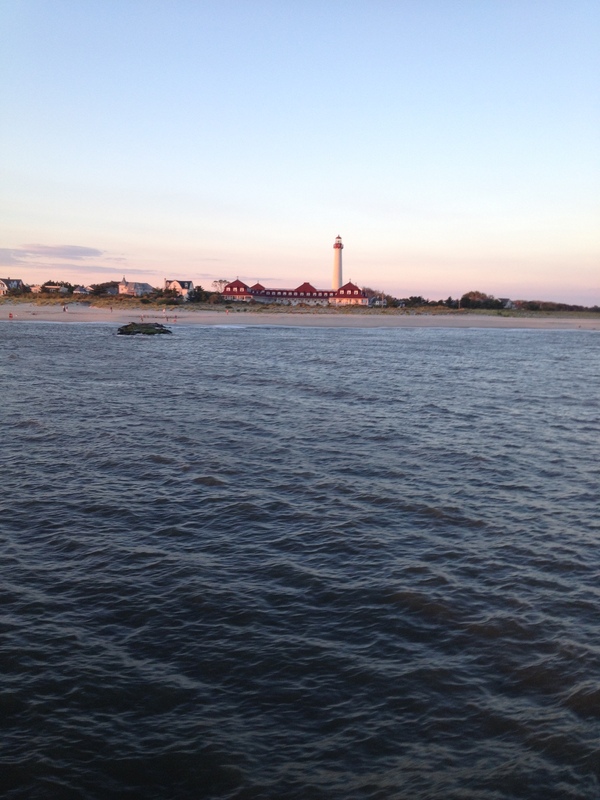 ​Cape May is dubbed “America’s Oldest Seashore Resort” and has a history dating back to the early 1600s. The town is located at the very southern tip of New Jersey (Exit 0 off of the NJ Parkway) where the Delaware Bay and Atlantic Ocean meet. As it’s name indicates, it is a cape but was later made into an island during World War II with a man-made canal (now known as the Cape May Canal) dividing and separating the land from the rest of New Jersey. ​I’d never been to this area before, and it was lovely. Gorgeous victorian houses, and a long expanse of beach, much of it untouched and with beautiful dunes. 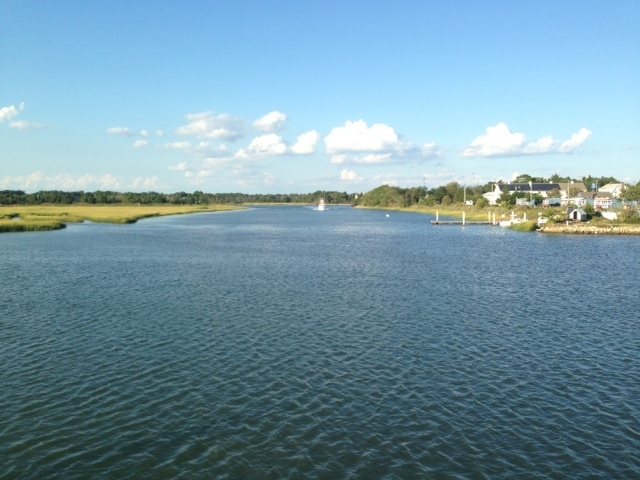 The weekend began, appropriately, with a boat trip of the course. 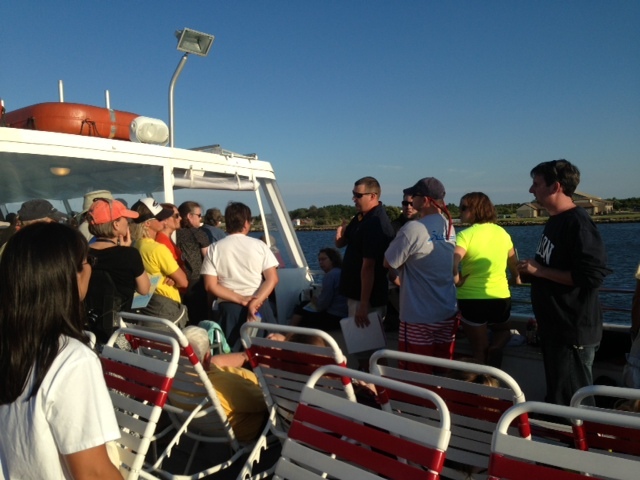 Swimmers and Kayakers gathered at the Cape May Whale Watcher where race director Jason Malick greeted us. The visionary behind this swim, Jason is an open water swimmer from the area who had completed the swim himself and thought it would appeal to us in the open water community. And he had exactly the right instincts! The trip offered us a view of the course we would be swimming the next morning and at sunset no less. Being with the other swimmers helped to make me feel less anxious. Despite what I believed, not everyone was a ridiculously accomplished marathon swimmer of crazy reputation. Some, like me, had never competed at this distance before. And it helped me to know that. That, and the fact that whatever anyone’s level of expertise, they were all happy to share information, talk, have fun, and be supportive in a way unprecedented in any athletic community I’ve ever been a part of. 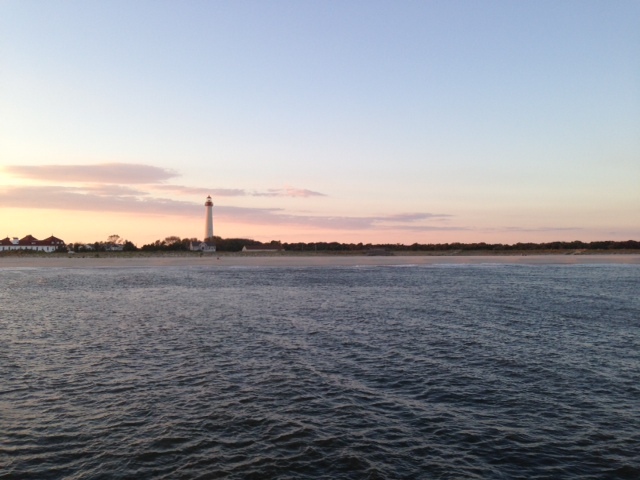 Talking with other swimmers, and the opportunity to see the course, including the historic Cape May lighthouse, eased my pre-swim anxiety significantly. I knew I had trained well, but that doesn’t stop those pesky doubts from creeping in. Thankfully, learning from and talking to others does help. The next morning, John and I met the other swimmers at Higbee Beach for the swim start. And finish. And the weather felt, ahem, slightly different than the day before. It was windy, with more chop that we’d seen the night before. Or maybe it had just looked calmer from the deck of a big boat. Either way, some of us were cold, huddling together, sharing towels and offering whatever extra clothes we had to those who needed to stay warm before the swim start. 20 swimmers were ready to take to the water, and after body marking and the kayakers getting to the start position, it was time. I get nervous before every swim,and this time, because it was a longer distance, I was literally nervous for days. Stomach churning nerves. For real. But what happens to me every time is that as soon as I hit the water, the nerves disappear. Instantly. I start to stroke and suddenly, I remember, I can swim. I have trained. I love the way my arms feel as they move through the water. I can feel my core rotating and I am reminded that I love the water. This time was no different. Except for that jellyfish I speared with my very first stroke, and all the ones who perished after. I swam out parallel to the jetty the stretched from the starting beach, looking for John and our trusty yellow kayak. Before I saw him, it was time to round the jetty and enter the canal. I took a wide line, at least I thought I had. The chop was rough and the current was strong, sweeping you down the canal and hopefully, past the ferry station before the departure of the first ferry of the day. My line, however, was apparently, not quite wide enough and before the swim was minutes old, I had hit a hidden underground rock – HARD – and cut my hand. The 1-inch cut on my right hand started bleeding immediately, but I knew it wasn’t deep and there was no way it was stopping me. I kept swimming. The trip through the canal was fantastic. Calm, with a helping current that was welcome with the knowledge of what was to come. I was loving it. Enjoying the swimming, feeling great, and getting used to the endless number of jellyfish I grabbed with each stroke. Feedings were going smoothly and wonder of all wonders, I was actually WARM in the water! This is completely unusual for me as I am a total cold water wimp. The harbor was beautiful too, and John chose perfect lines for me to make my way through it quickly. 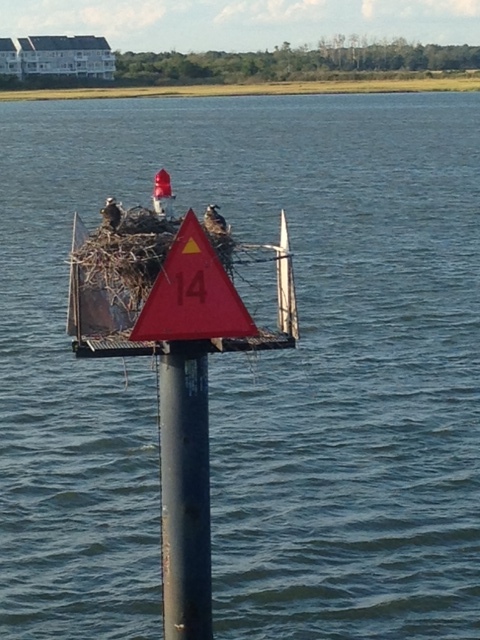 Then, we reached the Cape May Inlet. It was then that John told me that a swimmer had left the swim, and I knew that things were intensifying for some folks. Then, we entered the Atlantic. I use the word WE quite consciously. As I have probably said before, I consider open water swimming to be a team sport. My husband and I are a unit. In many ways, I have the easy part. I swim. Navigates the safest and most efficient route for me. Times my feedings and ensures that I am receiving the correct nutrition at the right time. Counts my strokes and stroke rate to ensure that it’s not dropping off in a way that could indicate distress. Maintains communication with race officials to ensure that he knows what is happening on the course, is aware of possible weather complications, and knows if there are race details or information we both need to be aware of. Kayaks, choosing his line while ensuring I am always in his sight line, and manages the waves and chop that mean his course sometimes needs to be slightly different than that of my own. It was after the transition to the Atlantic that I needed him most. When we transitioned to the Atlantic, the water temperature dropped dramatically. And my body was not happy about it. As a sufferer of Raynaud’s Syndrome, my hands and feet react in extreme ways to cold temperatures. Within minutes, my hands were numb, and it felt like I was swimming with baseball mitts on my hands and with Herman Munster shoes on my feet. I could not feel the water. I told John it was time to move to the hot feedings. I use miso soup, which works well for me because it’s hot, has enough salt, protein, and calories for my needs, and I can stomach it over the course of several hours of swimming. This time, I used it as a hand warmer too, literally sticking my hands in it for a few seconds before I consumed the cups John gave me at each feeding. The water was getting rough and choppy. But more than that, it was the wind. The wind felt relentless, and didn’t help with my hands. 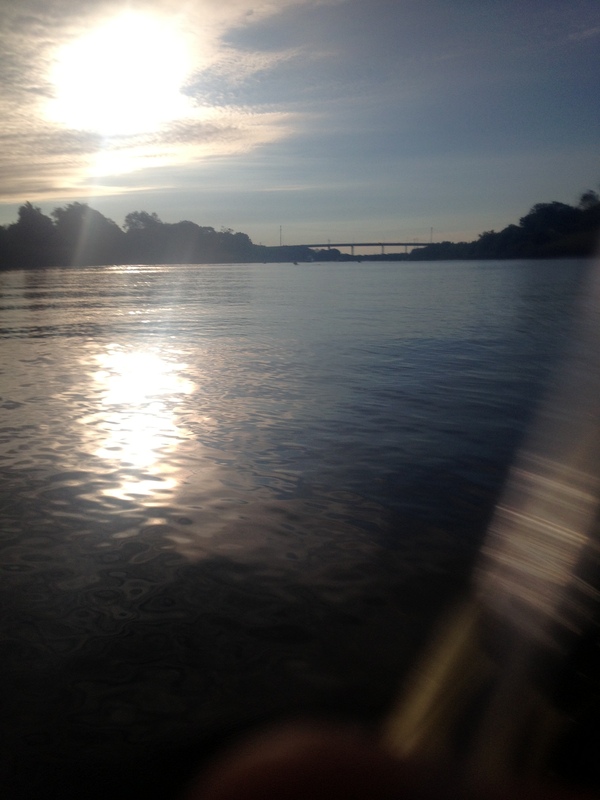 My teeth were chattering but I was determined that nothing was taking me out of this swim! Then, miraculously, I felt a wall of warmth and the water temperature changed again. At first, I wondered if I was actually getting hypothermic and hallucinating that the water was warming. I started mentally running through the signs of hypothermia. Could I tell what day it was? Could I count? Finally, I decided that it felt good and I wasn’t going to question it. I would just keep swimming. And swimming. And swimming. At one point, the water calmed enough the John felt he could take a bit of video. And yes, this was the CALM part. And so I just kept swimming. Shortly after, John stopped me again. It was dream come true for me. I am one of those dorky swimmers who has longed to swim with dolphins. And now, it happened. In New Jersey of all places! A baby dolphin. Swimming right near me. A few miles after our National Geographic dolphin encounter, it was time to pass through The Rips. Turbulence was an understatement indeed. By this time, John was getting a lot of news over the radio and let me know that a few other swimmers had left the swim, before The Rips. As a result of the wind, some kayakers were also having difficulty keeping up with their swimmers and there was some separation happening. 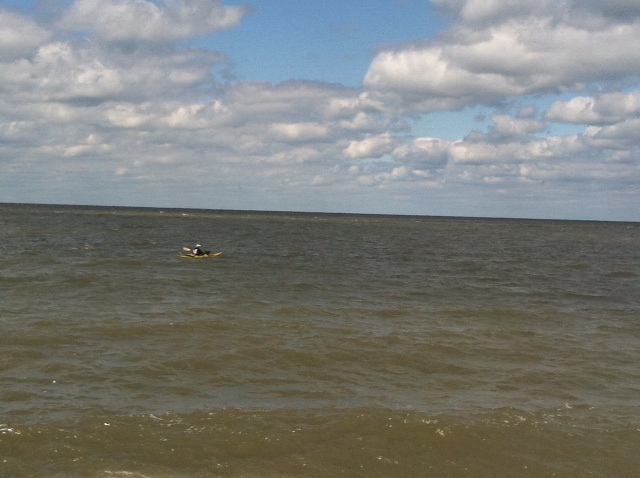 Swimmers and kayakers losing one another, thankfully with only happy endings. John stopped me for an early feed before entering The Rips and told me that we would be cutting it as close to the shore as possible in an attempt to avoid the bulk of the rough water. The water was like nothing I had been in before. Lifting me up, slamming me down, and I was often unable to see John through the 6-foot swells. It was clear that John was feeling some stress and he was trying to navigate the kayak successfully while also keeping his eyes on me, and ensuring both of our safety. I did some breaststroke because it was impossible to get breath swimming freestyle and I wanted to be able to see what waves were coming at me. And then, we were through it. It was probably faster than it felt going through it. And I should probably drag out this part of the story just to emphasize how truly dramatic this part was. Because it was. It’s not an overstatement to say again that this is a team sport and that the role of the kayaker, or support boat, cannot be overstated. 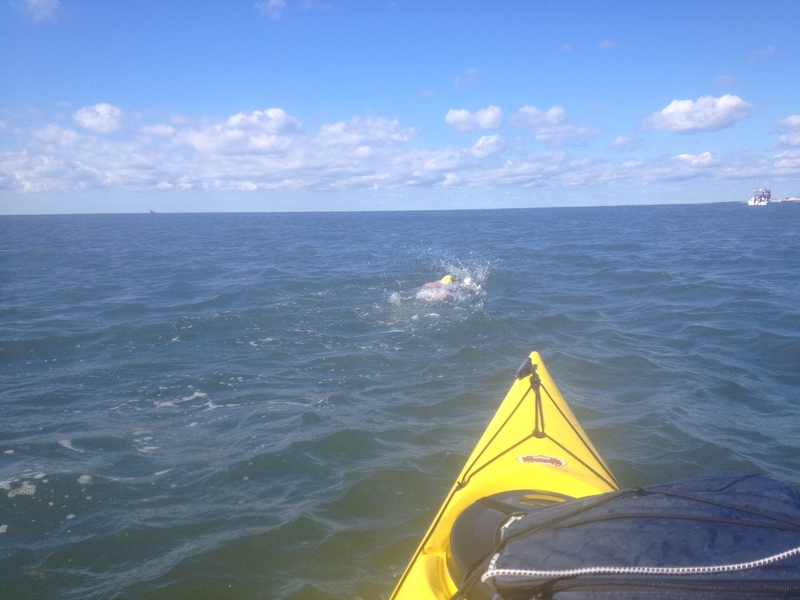 John and I talked a lot after this race and we both agree that it essential that races treat the kayaker as a vital and integral part of the swim, with appropriate training and instruction as befitting the seriousness of their role. 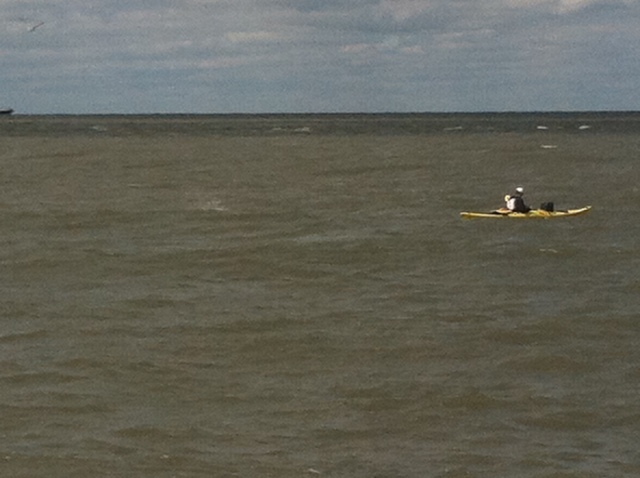 This was the hardest race kayaking he has ever had to do, and he learned as much as I did during this race. When we made it through The Rips, the relief was palpable for both of us. It was time to finish this swim! The wind was still strong, and the lighthouse and water towers seemed like we could NEVER pass them. It was like we were standing still on the water. 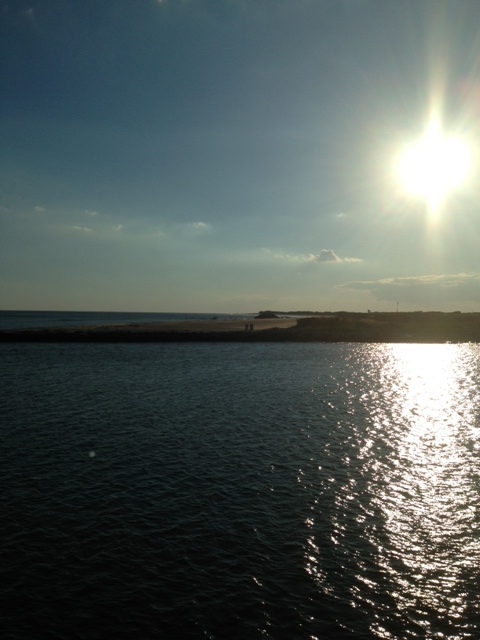 We made our way past Sunset Beach, and there were my son and mother waving from the beach. 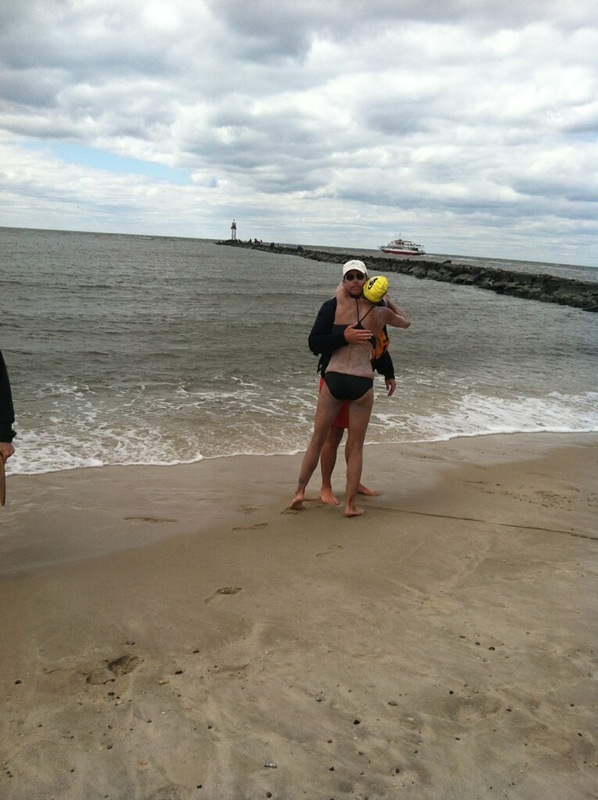 I knew I’d get a kid snuggle when I came in and I could see the big pink buoy marking the swim finish. It was actually happening. My first 15.1 mile swim, and what marked me, at least for myself, as a marathon swimmer in earnest. After having to drop out of a stage of the 8-Bridges swim earlier this summer, it weighed on my mind. I wanted that 15-miles badly. I wanted that feeling of accomplishment. I wanted to know I could do it. We got closer and closer to shore, within 500 yards. Then the sting happened. 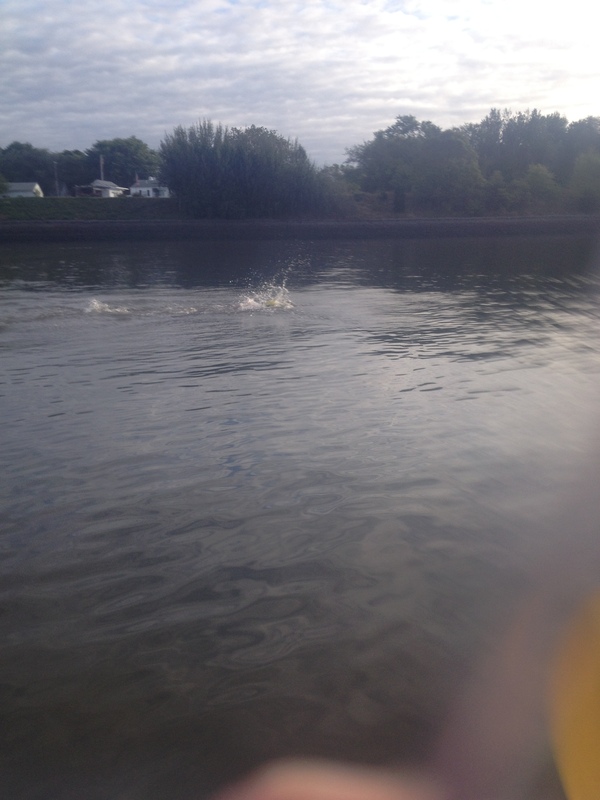 15 miles and the darn jellyfish got revenge for all of the jellies I had dismembered throughout my swim. Unlike my man-o-war sting of years ago, this was an annoyance. A burn, an itch, but nothing that would stop me. Instead, I did it. 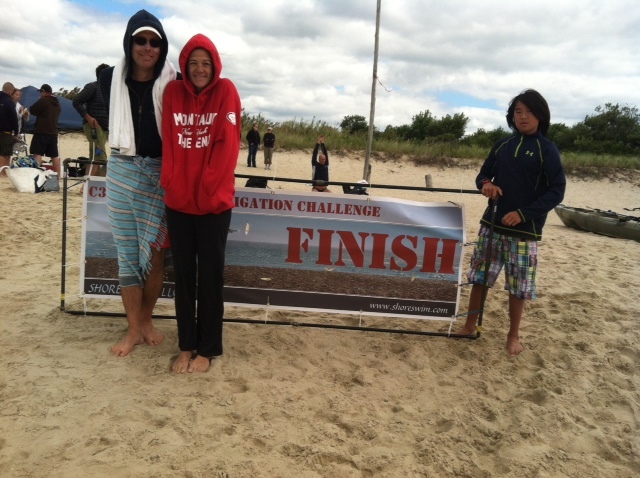 15.1 miles in conditions that bested some darn talented swimmers. Or rather, WE did it. My wonderful kayaker, husband, teammate, best friend, and so much more, and I had done this. And I felt gratitude, excitement, and overwhelming joy. In fact, I had felt like I was smiling for most of the swim itself. For me, while I am, of course, happy with my time and position upon completion of the race, that’s not what this was about. It was about finishing the swim, knowing I could do it, boosting my confidence for future swims, and most important, meeting and hanging with a collection of warm, funny, wise, kooky, and committed folks who totally and completely get this crazy swim thing that I love. Thank you to Jason Malick for putting this complicated, wonderful, intense, and beautiful swim together, and thank you to everyone who participated in the C3 inaugural event. I had a blast and wouldn’t have wanted to be anywhere else this weekend! « Congratulations to Check for Change athletes!